Perennial plants are a great way to brighten your flower garden with color and form without the work of planting annuals every year. Once established these plants come back stronger each season and make a strong impact. However the majority of these garden flowers are at their best in spring and early summer and perhaps in fall, but just at the height of summer your flower garden may become a little low on color. You can easily boost the impact of your flower garden at that time of year using annual flowers seeds without producing the large numbers needed for an all-annuals garden. Since most perennials become tall you should choose flower seeds of the larger annuals so they will show well. You can still use smaller varieties in the front of your beds. 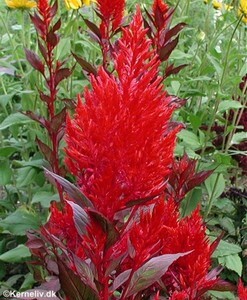 They should also be heat-tolerant and happy to flower in late summer. Choose colors and forms that are similar to perennial flowers so that they don’t look out of place among the perennials. 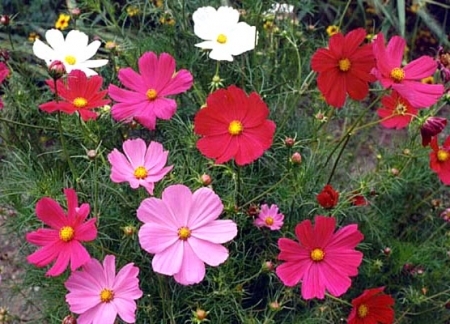 Cosmos are annuals that can be slow to bloom but that doesn’t matter when used in the perennial flower garden. Sensation Cosmos Flower Seeds (Cosmos bipinnatus) grow to around five feet and produce a continuous display from mid-summer into the fall. Their pink, white or purple daisy flowers fit in well with perennials like border phlox that are in bloom at the same time. For the best colours and to be sure of flowers, pick the weaker seedlings when transplanting as the big ones may produce leaves but no flowers. Another yellow-flowered annual is the popular Black-eyed Susan Flower (Rudbeckia hirta). It’s striking flowers – yellow stars with black centres – will liven up the front and middle of your flower garden. This plant is happy in full sun and dry conditions. For height towards the back of the flower garden Sunflowers really fit the bill. Try some interesting colors like the ‘Velvet Queen Sunflower ‘in rich reddish purple, or ‘Lemon Queen Sunflower’ in pale citrus white. ‘Autumn Beauty Sunflower’ is another good variety and all these sunflowers are branching and stay below six feet. Cut off the flowers as they begin to fade so that the plants will keep blooming. In fall stop cutting the flowers so they develop seeds as food for local birds. Other heat-tolerant garden flowers include ‘California Giant Zinnia’ which make a spectacular show in late summer and ‘Forest Fire Celosia’ with its flashy red plumes that will brighten the dullest garden. Finally, for shady parts of your flower garden, Foxglove (Digitalis purpurea) will usually flower in the same year if sown early. The beautiful spikes of lavender flowers rise gracefully over Hostas and other shade perennials to bring color to the darkest corner.